In Colombia’s capital the Virgin Mary is hailed as “The Queen of Transportation”. 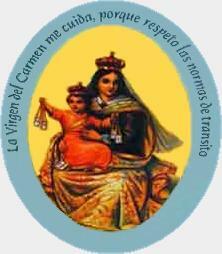 According to Bogotá’s municipal transport logo, “The Virgin of El Carmen protects me because I obey the traffic rules” ― not just because I have her medal hanging from my rear-view mirror. Colombia's first concordat (1887) returned to the Church much of the power it had enjoyed in the colonial period, including the right to administer “mission territories” which comprised more than 60 percent of the country. The standard work in Spanish details all the concordats up to 1988: here are a few summaries in English from the web that show how Church and state were interwoven in Columbia.